Born in Vigo, Spain, Tomás Alonso has been travelling since the age of 19 to pursue his career as a designer. In London in 2006 he co-founded the design collective OKAYstudio with five other graduates from the Royal College of Art. Named Designer of the Year 2013 by AD magazine in Spain, his work has been widely published and exhibited around the world. His practice, based in North East London, works in furniture, product, lighting, interior and exhibition design. He combines research and commercial design work with teaching: he has been involved with the product design master’s course at ÉCAL in Lausanne since its inception in 2010. The collaboration between Wiener Silber Manufactur and Tomás Alonso started in 2011, when Tomás was invited by Vienna Design Week to develop a new design together with this world-renowned company, which was established in the Austrian capital in 1882. A new interpretation of Tomás Alonso’s much-praised Tea-Set of 2011, the Bar Set was inspired by Josef Hoffmann, a pioneer of Viennese design in around 1900. His pure geometrical language inspired both the functionality of Tomás Alonso’s design and Urs Bally’s skilful hands. Born in Wasserburg am Inn in 1987, Urs has been working since 2009 as a silversmith at the Wiener Silber Manufactur. Silver is a soft metal but not a soft material. 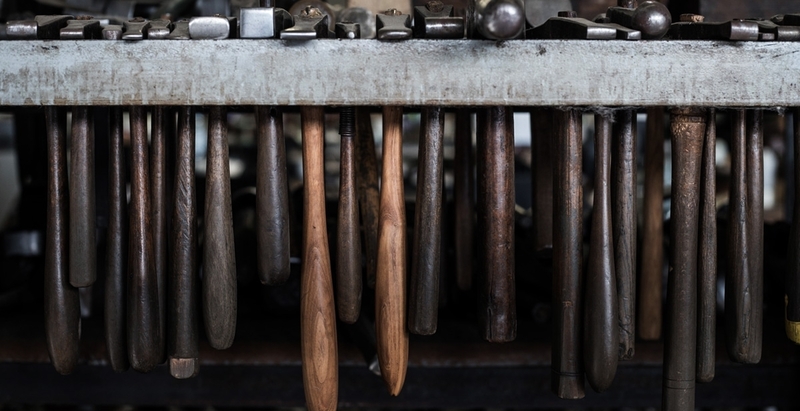 In order to wrest forms from it, the artisan has to expose it to heat and acid, treat it with rollers, punches, hammers and cutters – that is one side of the process. The other side is mental work, combined with a great deal of feeling. A magical metamorphosis is achieved when all the components harmonise, like in this refined Bar Set.